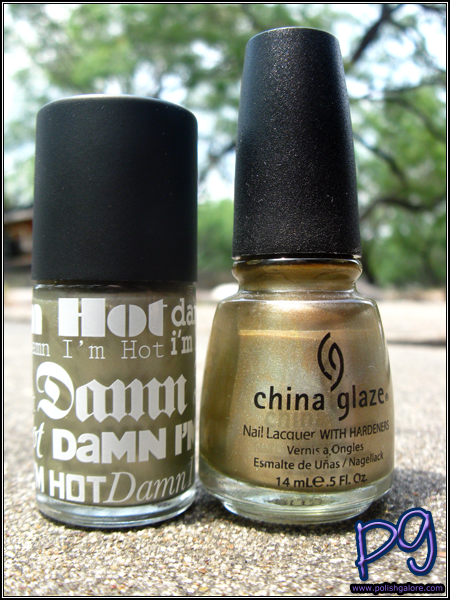 While applying Cheeky Monkey Damn I'm Hot, I kept thinking it looked like China Glaze 2030 from the Khrome Collection. Now, side by side on the bottle, you can't really tell that they are as similar as I think they are. 2030 looks much more gold than Damn I'm Hot. For Damn I'm Hot, I used a base coat of Cheeky Monkey Get Wet, and for 2030 I used a base coat of Seche Natural. I have 2 coats of Damn I'm Hot, but only one coat of 2030. I topped both with Seche Vite.